The International Court of Justice came to the decision that Kosovo did not break any international laws when it declared its independence from Serbia in 2008. Kosovo used to be part of a country called Serbia, which in turn used to be part of a country called Yugoslavia. In 1991, Yugoslavia started splitting up into different countries. Slovenia, Croatia, and Macedonia were the first to break away. In 1992, Bosnia and Herzegovina (that’s just one country, not two!) broke away. What remained of Yugoslavia became two more countries in 2006 – Serbia and Montenegro. Two years ago, Kosovo broke away. Many countries still consider Kosovo to be a part of Serbia and do not recognize its independence. So far 69 countries have recognized Kosovo as an independent country. So why did Kosovo break away from Serbia? The biggest reason was the differences in the people living in Kosovo and in the rest of Serbia. While most people living in Serbia are Serbs, Kosovo is mainly inhabited by Albanians. Kosovo is a neighbor of the country Albania. In the late 1990s, there was a conflict between these two groups of people. In 1999, NATO and the UN, two international organizations, stepped in to end the fighting. Kosovo had been under UN administration until its declaration of independence two years ago. 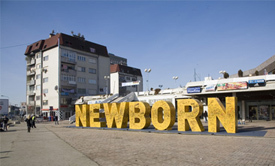 A “Newborn” monument was built to celebrate Kosovo’s independence in its capital, Pristina. The Albanians have a beautiful string instrument, the ciftelia, that is very popular in Kosovo. It has a pear-shaped sound bowl made out of a single piece of wood. The ciftelia usually has just two strings.